Playing with excel, I made the following chart based on Shenzhen’s published population statistics (here, here, and here). Note the population unit is 10,000. Thus, in 2011, the total population with Shenzhen hukou was 2,594,000 and without Shenzhen hukou was 9,017,000, making the official population 11,611,000. More importantly, roughly 70% of Shenzhen’s official population comes from someplace else and this is a reduction in the hukou to longterm residence ration. These figures do not include estimates for the illegal floating population, which is estimated to be about 2 million. 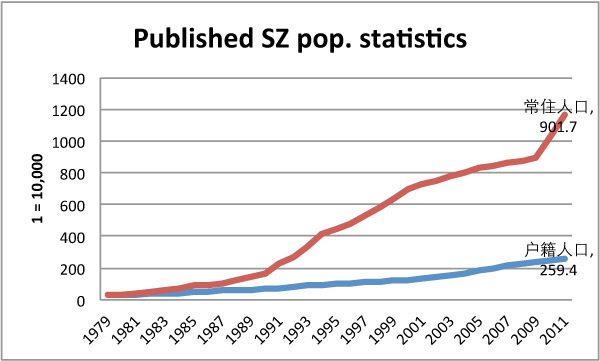 Thus, until I hear otherwise, I’m attributing the sudden rise in official population figures over the past two years to recent attempts to normalize Shenzhen’s hukou structure. * Update (Feb 17, 2012): The Shenzhen bus propaganda is putting Shenzhen’s official population at 14.5 million. Seems that the hukou and residence permit inclusion policies continue because the SEZ’s official population grew roughly 3 million in 2011. If the unit is really 10,000. then the number should be 11,611,000 not 1,161,100, I think. Check again. TS, thank you for catching my mistake. I have corrected the figures. Hey! Where did you download design of your website? Thank you, this is a wordpress theme, Imbalance 2. I like it a lot because it allows for posts with and without images.